Good lord. I think that's the longest posted wait time in history. Can you imagine waiting all that time, being next to ride and having the ride go down? I think I'd kill myself. That would be horrible! And I thought waiting an hour for Maverick and Millennium Force were bad. I think that might dethrone 10/12/13 at CP. If I went to a park and saw wait times were that long, I wouldn't step foot in the gate. I wonder if that's just a glitch or if it's real? Oh, it's real. Diagon Alley opened to the public today. I'm glad i could care less about it.I'd be at busch gardens tampa! How much less about it could you care? Oh, you mean you *couldn't* care less? Interestingly enough, it would take about 7 hours for me to recover AFTER the ride if it makes me as nauseous as the Potter ride did. So, that is a 14 hour commitment for one ride. Must be one hell of a ride. Do you suppose there's even one person who disembarks and says "wow, that sure was worth the wait!" ? Btw, wahoo skipper, I have to agree about the Potter ride. I never ever get sick on the rides and after my first spin on that one I was riding the bench for about a half hour. That ride was one of the best things I'd ever experienced, though, so it didn't keep me from trying again. And again and again. Then two more times on a future visit. Funny, after some rides I was fine, and after others I was sick again. Did Hogsmeade have such crushing crowds when it opened? I suppose after the smashing success of the first one the buzz around the second one is greater and now even more people are anxious to experience both. I still haven't heard a lot of details regarding the new ride, but I do hear it described mainly as a dark ride. The park clearly labels it as a coaster, I see. But whatever it is it must be reeeeeealy good. I never thought it would happen, but a few years back I found myself accepting an invitation to join some friends for the midnight premiere of the last Potter film. Granted we didn't wait 450 minutes, but the line really did raise the excitement for the film. It was festive and fun, with cops cruising by the long line on the sidewalk, costumes and the like. I suspect 450 minutes is a point of pride for the kids and nerds waiting in line. The poor parents on vacation sure are getting a raw deal though. I'm curious to see how long the insane period lasts before things settle down. The Ukranian Ironbelly (dragon) is cool and all, but It kind of takes away from the atmosphere. Everything else in Diagon Alley moves quite a bit, but a static dragon that breaks the storyline of the ride? No thank you. Did Hogsmeade have such crushing crowds when it opened? Oh hells to the no! "No thank you," Rickrollercoaster? Are you saying that you would not partake in riding the new Gringotts coaster or visiting the new part of the park because they built a static dragon on the top of the building? You wouldn't even go? Anyway, I thought that dragon did stuff. It's been described as an attraction in itself, and is a integral part of the design as far as the storyline goes. Am I wrong? Like I said on Gonch's Facebook post, I waited for three hous opening day of Banshee because a young friend of mine wanted to ride it. I got all my Banshee riding done the day before, but it sure was exciting to stand there for that long with all those people. It really wasn't too bad. My limit is probably about one hour before I reconsider waiting. And I need to comment on Gators Universal photo. 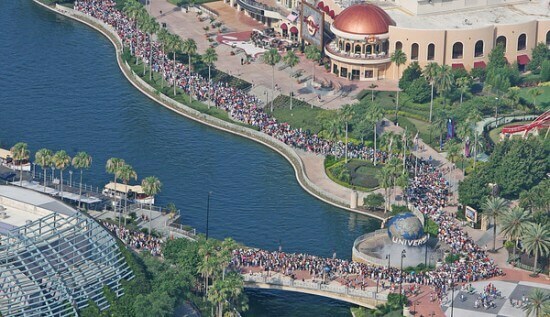 Does IOA even have enough capacity within the gates to contain all those people who were in that line? add much more capacity and eventually help to alleviate some of the crowds at both Harry Potter parks? add to attendance so much that both Potter parks see extremely large crowds? A little bit in the middle of the two? My third option would be the kind of balance that I would hope for. Adding to overall attendance of the two theme parks while helping to alleviate the crowds at the two Harry Potter areas. I bet they sell a lot more two-park passes now. Actually, Rick is too busy standing in line for 450 days waiting for the new Holiday World attraction to open. What I notice in Mr. Gator's astounding photo, in the lower right hand corner, are the few (smart) souls who actually seem to be heading to the Studios park for the day! I bet Mummy was a walk-on!